Packing for travel is an art. You want to make sure that you have what you need to feel your best, without having to lug a steamer trunk filled with your entire life. MWS has curated 7 essential makeup travel items that will ensure you have that extra polish, without saddling you with a million products. Every makeup artist knows that the key to flawless looking skin is blending. Nothing looks worse than streaky makeup and seam-like lines at the edge of your makeup. Beautyblender was created by top Hollywood Make Up Artists Rea Ann Silva and Veronica Lorenz and leaves you looking like you’ve been made up by a pro. The elliptical shape makes application foolproof by allowing you to access hard-to-reach areas with ease, contouring your face and leaving your makeup undetectable. 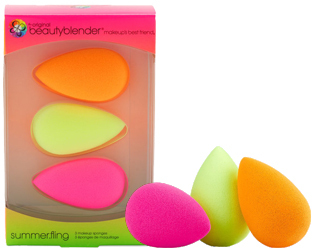 Beautyblender Summer.Fling is a limited edition set that comes with the original Beautyblender plus two fun additions for a little summer fun: beautyblender pop in bright orange and beautyblender glow in dazzling neon green. An added benefit: these don’t sponge up as much makeup so there’s less product waste. You may be hitting the town at night and waking up early to get the most out your travel days, but you want to stay looking bright eyed. Japonesque Heated Mini Eyelash Curler opens your eyes up with that perfect curl. It heats up quickly and curls effectively, so no waiting around and wasting precious time, and it’s small and easy to slip into your bag. A great manicure makes you look put together, something you want to maintain even while you’re traveling. 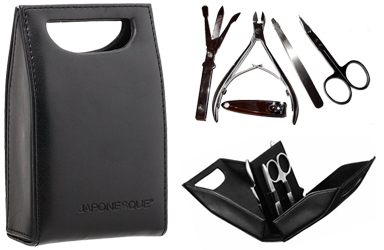 Japonesque Manicure Set has everything you need to keep those nails in shape. Housed in a handy, protective case, the set includes: Tweezers, Nail Clipper, Nail Nippers, Nail & Cuticle Scissor, Combination Nail File, Nail Grooming Tool, Nail Scoop. Whether you’re heading to the beach or discovering a new city and wandering around, travel usually means more exposure to the elements. Julie Hewett Organic Camellia Oil is a great product to have on hand for repairing your skin fast. It moisturizes, softens wrinkles, improves complexion, heals scars, and protects your skin from harsh elements, including UV rays. Camellia Oil is natural antioxidant containing vitamins A,B, C, E, K & P with minerals P, Za, Ca, Fe, Mn, and Mg. It also helps prevent sunburn, freckles and age spots. Tuck this in your TSA-approved clear bag and you’ve got a powerful beauty secret on the go! Don’t forget the lips! Lips are sensitive and need protection from the elements, too. 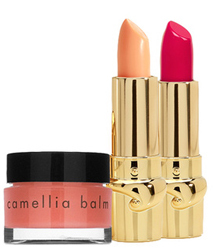 Julie Hewett Camellia Lip Balm combines Camellia with Rose and Orange essential oils to sooth and moisturize chapped lips. It glides on beautifully on it’s own, or can be worn on top of lip liner for a more glamorous sheen. 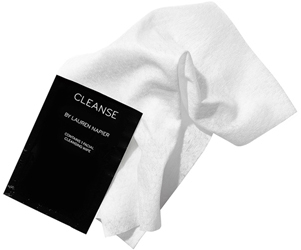 You may need a one swipe option for removing your make up at night, and these Lauren Napier CLEANSE Wipes do that job well. You can keep a few of them in your bag and are great if you want to refresh at the end of a long flight or to keep in your beach bag. Soothing and ready to go! Want to make that blow out last and don’t have the time to wash and style your hair every day? 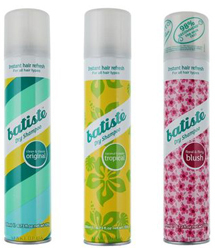 Batiste Dry Shampoo is the perfect pick for keeping gorgeous locks with minimal effort. It comes in a handy travel size and will absorb oil, make your hair smell great and act as a volumizing styling tool. Choose from Original, Tropical or floral Blush scents. 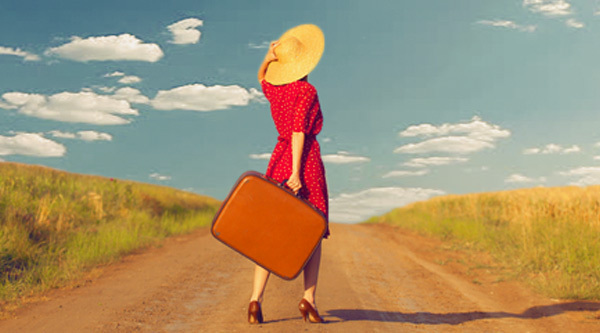 What are your favorite must-haves for staying beautiful while you travel? Tagged beauty routine, dry shampoo, hair care, Makeup, skin care, Travel. Bookmark the permalink.